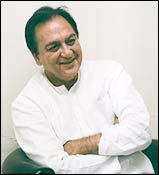 Actor-politician Sunil Dutt touched many people's lives in his 74 years (he would have been 75 on June 6). 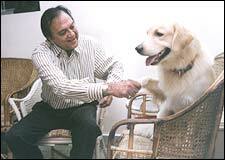 And journalist Lata Khubchandani is one of those who remembers Mr Dutt very fondly. 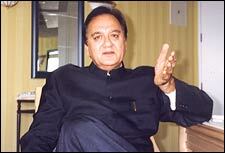 I came to Mumbai in my teens. I managed to get a place at Kala Ghoda (south Mumbai) in the Army/Navy building. I shared a room with eight people, which included tailors, barbers, all sorts of people. I studied at the Jaihind College (in south Mumbai) and also worked with BEST (the Bombay Electric and Transport Undertaking). It used to be very hot those days. We would just leave our room and sleep on the pavement. We used to sleep right outside an Irani restaurant. It used to open at 5.30 am every day -- and that was our wake-up call. As soon as it opened, we would ask for tea. My days started that way, before I left for my early morning classes. We didn't have much money those days. I could afford only the cheapest fare. I recall two other restaurants that I used to go to. In Dadar, at Khodadad Circle (northcentral Mumbai), there was another Irani café which we frequented. Then, there was another at Churchgate station (south Mumbai), where we would sit and eat khari (a crunchy, baked biscuit) and chai. Where was the money for anything else? It was difficult to live in the Mumbai of the olden days without the Irani cafés. Those were the restaurants we frequented. Today's generation goes to 5-star hotels. I used to be facinated by the waiters who could carry ten to 12 cups of tea and serve everyone at once. The cups would never fall. Watching this feat was a favourite pastime. The Irani cafés have contributed to all of us strugglers. Their wonderful tea, their baked items. I recall the breadrolls we used to eat. We would sit in groups and discuss our day's events. Our dreams. Those days hold a lot of pleasurable nostalgia for me. I remember when I visited my village (in Pakistan) again after 50 years. I was invited by then prime minister Nawaz Sharief. He was very kind when I told him my desire to visit my village. He made all the arrangements for my visit. My village is called Khurd. It is about 14 miles from Jhelum city, which is on the banks of the Jhelum river. I have always felt that the people of Pakistan are as affectionate and caring as our own people. You will be surprised (if I told you that) when I went to my village, the entire village gathered to welcome me. I thought they were doing this because I am an actor and they know me. But it was because they genuinely felt that I belonged there, and that I was coming back for a visit. I got a big reception there. All those who studied with me came to meet me. (I met) women who were then 10 years old, (and)were now 60 or 65. My brother's nickname is Soma. They asked about him, my sister Rani and my mother Kulwanti. They remembered all their names. Imagine, after 50 years! It would be understandable if they did that to me -- am an actor. But my family has not been in the public eye. For me, it was a really emotional moment. I told them my mother had passed away. In Punjab, when someone passes away, women beat their chests. When they heard about my mother, they started beating their chests as if someone from their own family had died. Where would one get more sincere emotion than this? To think that after 50 years, people forget their relatives. These people gave me so much emotion and sentiment. I was deeply touched. They took me out to the fields. They told me, "Yeh zameen teri hain (this land is yours], Balla.' My name is Balraj. I was called Balla. All this was not lip service. You could sense their sincerity, their genuineness. I am an actor-director. I can read a face and tell whether the person is genuine or not. There were television channels (present). The villagers were asked why they were giving me so much affection. My father died when I was just five. We lived in the village without any problem. There were more Muslims than Hindus there. 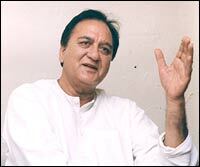 During Partition, my entire family was saved by a Muslim. His name was Yakub -- a friend of my father's who lived a mile-and-a-half away from our village. He helped us escape to the main city, Jhelum. I left Pakistan after I my matriculation. I never had the chance to visit Lahore. I visited Karachi when I was invited to attend Benazir Bhutto's marriage. I was very keen that my wife (Nargis, who passed away in May 1981) should also see my village, how we went to school. I used to tell her stories about our life there. In Jhelum, I studied at the DAV School. I travelled to school on horseback all through my middle school years, that is from Class V to Class VIII. My school was eight miles away, and there was no other conveyance in those days. Being zamindars, we had many horses. One horse was kept specially for me to go to school. I also remember Rawalpindi, where I studied at DAV School for a year. There was Murree Road, where my school was. Murree is a hill station. It was called Ko Murree. 'Ko' means mountain. Buses plied from Rawalpindi to Murree. Then there was Garden College, through which we would walk to get to our school. DAV College was just opposite Garden College, but Garden had this huge complex which we loved. There was this area called Naya Mohalla, where my relatives were. I would live there with them. Films were taboo for us in those days. We would just look at the posters. My wife was keen to go to Pakistan and see all this. Unfortunately, she couldn't. I really feel this process that has started between our two countries is very positive. Somehow, this hatred should come to an end. I am a believer of nonviolence. I believe we all are one, whichever religion we belong to. I wish it culminates in something positive and we can both grow economically. The money we spend on weapons can be used to give water to the people, to educate everybody, to give them medical aid and to give employment to the youth of the country. If there is no friendship with one's neighbours, no one can progress. Look at Canada and the USA -- both countries help each other.